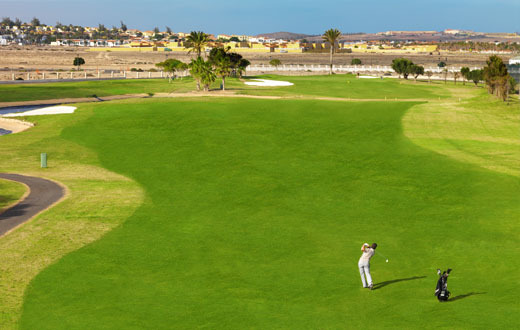 This unique 18 hole course in the Canaries, Fuerteventura, known as the quiet island, offers an exceptional practice area, driving range with more than 50 positions, 800 m2 green putting, green approach, bunker and Pro Shop store. 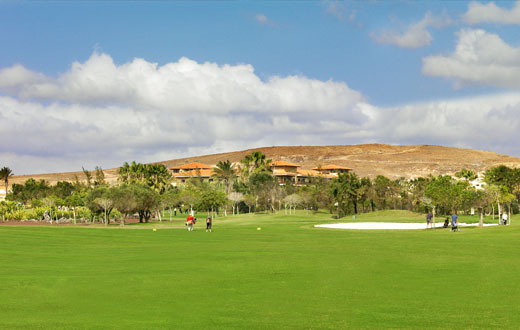 A safe environment, quiet, discrete and well communicated, just a few short minutes from the beautiful beaches of Fuerteventura declared a Biosphere Reserve by Unesco.Exclusive destiny for those who are looking to enjoy both golf and beach, nature, landscapes, and many leisure activities. 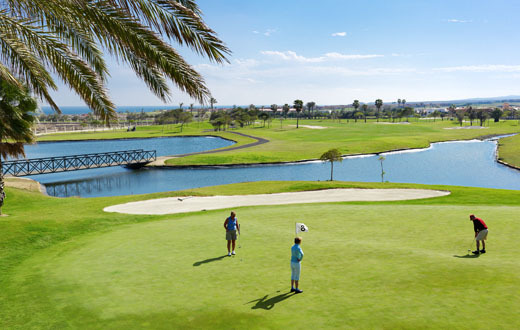 Golf and beach vacations in an unique place. Congratulations! 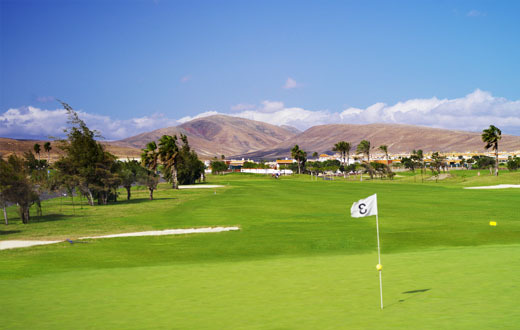 get ready to begin playing the first hole of the round at Fuerteventura Gplf Club. 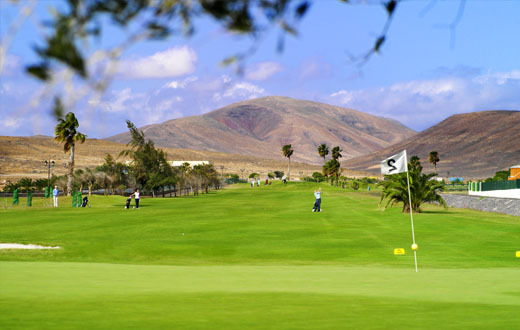 This pair 4 with light dogleg to the right is a good hole for measuring the level and what state of mind/mood we are in today for playing.From the yellow tee, there are 334 meters up to the beginning of the green and a fantastic view of the characteristic mountains of the island. If you are a striker, perhaps one club is enough to leave the second strike to the hole, if not, don´t worry, that´s what the Driver is for. The only thing you have to worry about in this first strike, is avoiding the two big bunkers in the fairway. Very well, we have the ball in the fairway and we see the flag, attention, we also see a frontal water obstacle, it will be a matter of a good approach to be able to get the ball in the green.We cross the bridge and proceed to kick, while standing in the green, we can feel that we are in a special place, a place different from all the rest I have seen before, this is Fuerteventura. Well! 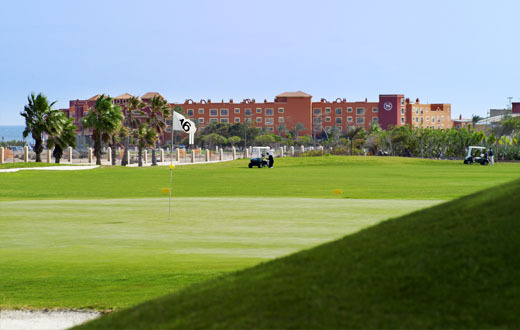 We have just begun and we are already facing the most difficult hole of the round, the handicap 1, no problem. 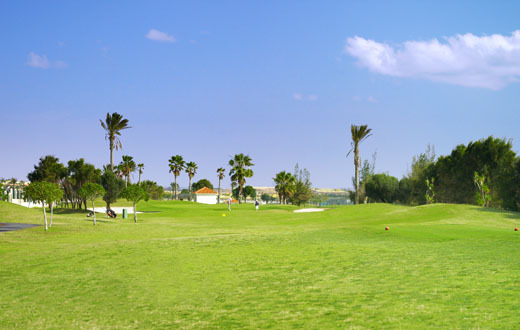 This 2nd hole is a pair 5 of 75 meters from the yellows,the cross that many professionals that disputed in the Open tournament of Spain in 2004 bared. From the tee, a pleasant sensation invades us as we descry the ocean in the background, and another that confirms that this may be the most complicated hole of the round. We find ourselves facing a very narrow fairway beginning with limits on the right and water obstacles on the left, our confidence with steels, clubs or Driver, will determine our strategy.Depending on the chosen strategy we will face the second strike, this one being more relaxed because the rough opens on the right side allowing a greater chance to miss. 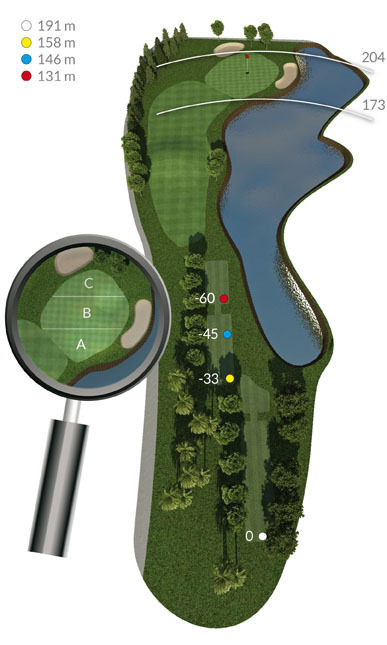 Go ahead, we are going to get a good result in the most difficult hole.We are in the green, have you given the hole a birdie? If I were your mate, I would ask you for the handicap. Pair? Incredible, this is your day. Bogey? Perfect, it feels good, lets go for the 3rd hole. A very pleasant breeze has transmitted to us a fantastic sensation of rest, peace, and enjoyment during the short passage up to the tee of the 3rd. We find ourselves before a pair 4 of 374 meters from yellow. 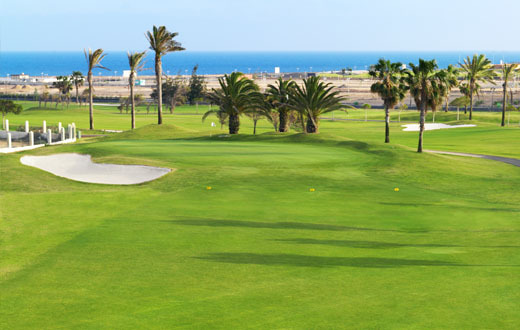 From the tee, we can see the ocean is even closer, and after having obtained a good result in the previous hole, I know this hole will be the confirmation that I have played a good game.The only thing you need to avoid is to go outside the limits across the right zone of the fairway, lean to the left. 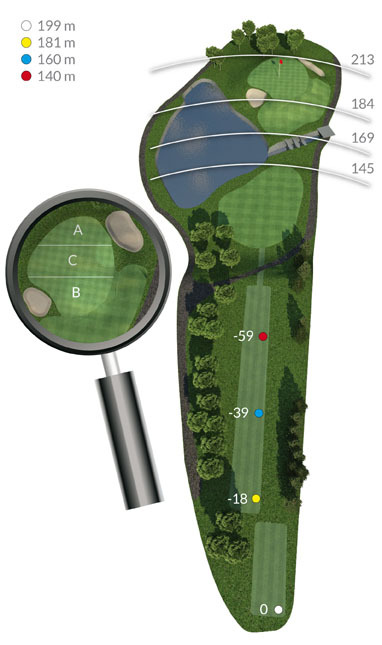 The green offers, just as most of the greens in this round, great dimensions. This one is protected by a bunker on the right.Approach and maximum 2 putt. You´re doing very well, keep going. We are now before the first pair of the round, 166 meters from the yellow bars, its time to show your skills with the clubs. Well, nobody is prohibiting the use of wood, hybrid, even Driver. As in all the pairs 3, our objective is to leave the ball in the green in the first strike. This green of the 4th pair is protected in its surrounding by bunkers that ask for precision.Good ball! What a shame that today there is no prize for closest ball, it might have been yours! What a good sensation we are getting from walking to the green, recreating ourselves in the view and knowing that we have a birdie in our hand, lets go for it. Between you and I, if it is a pair in the end, it´s not bad at all, I would sign it. Well, prepared to warm up the ball? We are before the first pair 5 of the round. Classic recovery pair 5 , not too long, 481 meters from the yellow. The image from the tee is fantastic, mountains in the background and an immense fairway to stretch. 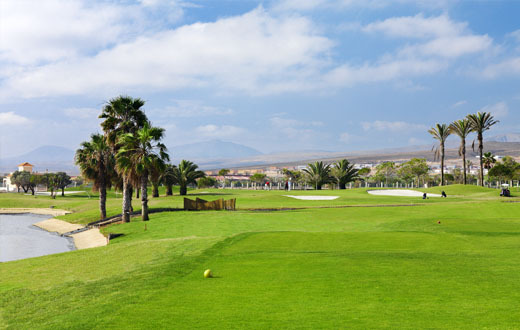 The only danger can come from the right lateral, a slice would put the ball outside the limits.Walking to our ball, our views and sensations invite us to think that we find ourselves in a course of great dimensions, built over flat terrain. More so each time, in the majority of the cases, due to the cost of the terrain the courses are constructed over uneven surfaces with a very irregular holography. This translates into holes over cliffs taken advantage of every last millimeter, holes with blind strikes, narrow fairways, greens with impossible flag positions. 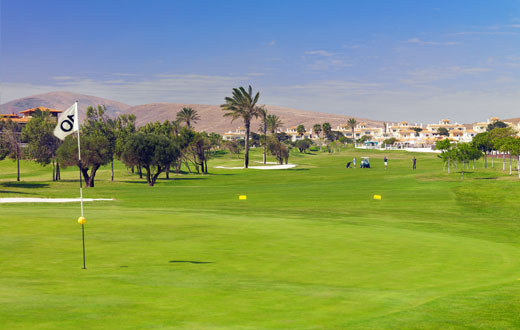 Definitely, in many cases courses do not call for enjoyment, courses that are impossible to walk through and are only playable if you rent a buggy.At Fuerteventura Golf Club, the player can easily walk through the course, now, if you require a buggy to play, don´t worry, we gladly render that service. Back to the game after a good exit, try to lean to the right of the fairway in this second strike, this one is broad and has no obstacles. Very good, this last strike did not bear much difficulty.The green of the 5th is surrounded by both laterals, depending on the position of the flag and where our ball sits, we will find more difficulty to pass the bunker. 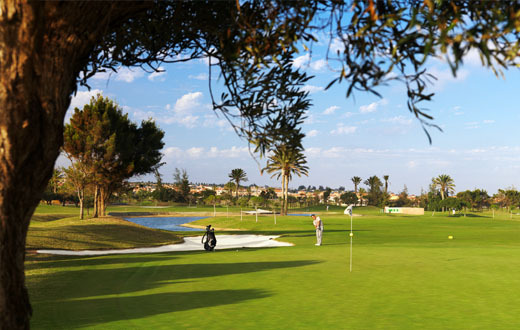 A good approach allows us to enter the green, to take the putter and think about the birdie. 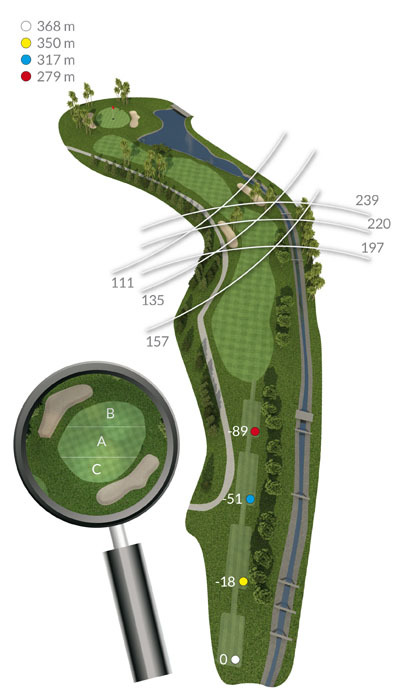 The 6th hole is a pair 4 of 364 meters from the yellow with a pronounced dogleg to the left. This impedes us from seeing the flag from the tee, but it allows us to enjoy impressive views of the mountains and the lake. Our objective? To place the ball in the corner with a second clean strike to the flag. Be careful, even though the fairway is broad, we have a small river with water to the right and outside limits on the left, though the palm trees try to dissuade us from leaning on this margin. 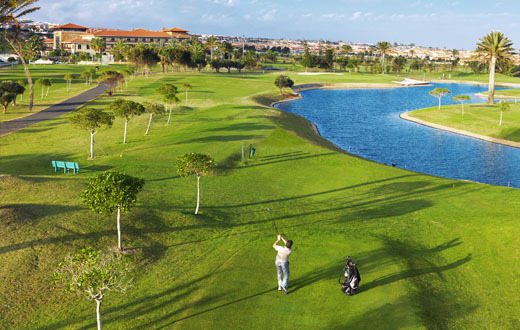 Just as it happens to many when we play this course for the first time, somehow we are amazed to find abundant water and green-life, its like an oasis. 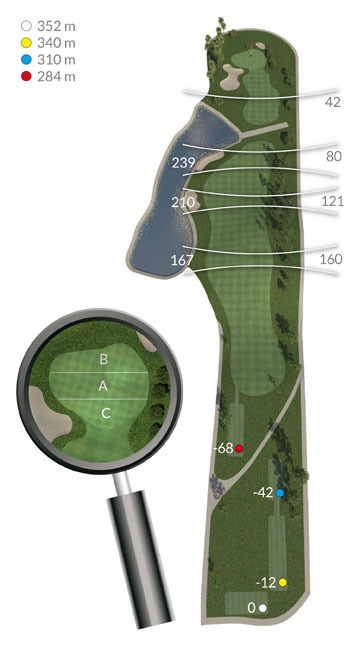 After a great exit, an 8 or 7 club will be enough to get the ball in this broad green. 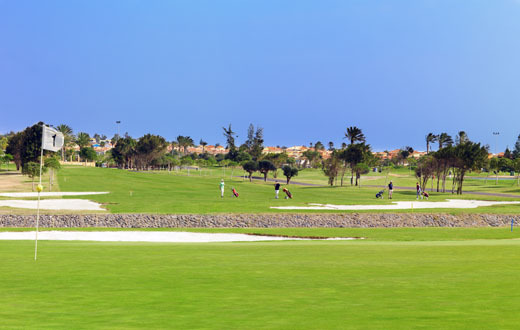 If we ask all those who have played at Fuertevenuta Golf at least on one occasion, with all certainty they would mention this hole in their first comments.This 7th hole is a pair 3 of 190 meters from the yellow, surely you´d think, what´s the problem? It´s not that long. 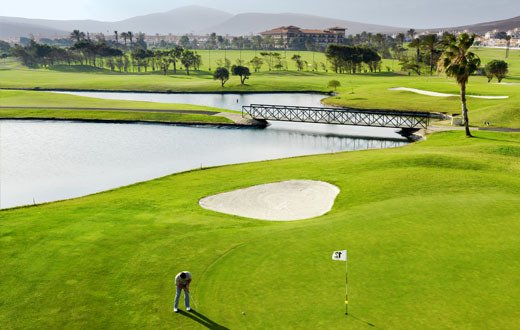 True, a steel club will leave the ball in the green, but beware, don´t miss or the ball will be in the water, for the 158 meters are difficult to cross in just the first strike. 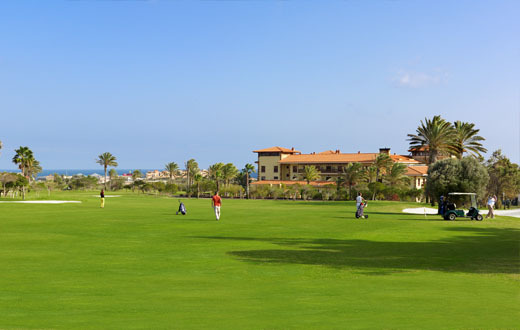 Those more conservative can lean to the left and try to make it to the green in two strikes.Concentrating on the tee, it does not allow us to relax and admire the architecture of the hotel integrated inside the course. Well, shall we go for the birdie? Approximately 30 meters separate the green from the 7th of the tee of the 8th, surround the practice green, approach zone and bunker. The path serves for making a quick recount of the card and to see that this hole, pair 4 of 369 meters from the yellow, is the third most complicated hole of the round, handicap 3.The sketch of the hole in the sign informs us that we are facing a hole with a pronounced dogleg to the left and outside limits marked from the tee to the corner. We can also observe the red watertight across all of the right margin of the hole. 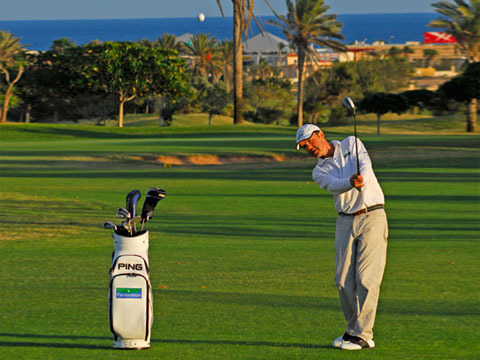 But, don´t get scared, with the lap you are doing you are sure to land it on the fairway. After having done a great exit, though long, we start to walk towards are second strike, surely you thought the corner of the fairway was closer, it’s true, from the tee we cannot see the small valley that stretched the fairway.This second one is a strike that entails a certain degree of complexity. We have the green at 140-150 meters, well defended, water to the right, bunkers all around and situated above the fairway level. A short strike can put the ball in the water after rolling down the ledge. 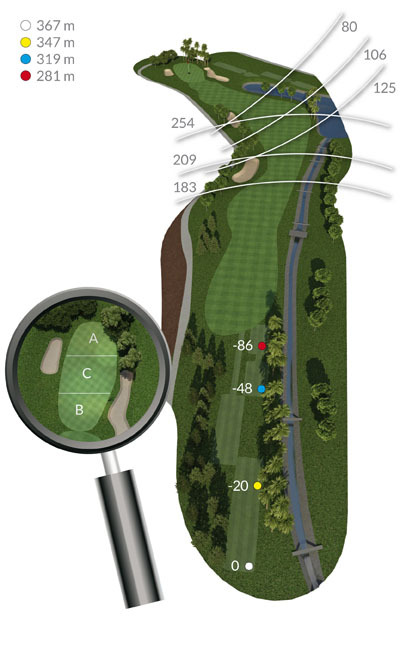 If you want to play in a more conservative manner, lean to the left, there´s less margin for error. But today is not the day to be conservative after all the strikes you´ve done, go ahead, attack that green. Great, the ball is in the green, the problem is that the flag is placed in the superior platform and we are in the inferior one. This is a good green to show your ability as a kicker, show it. 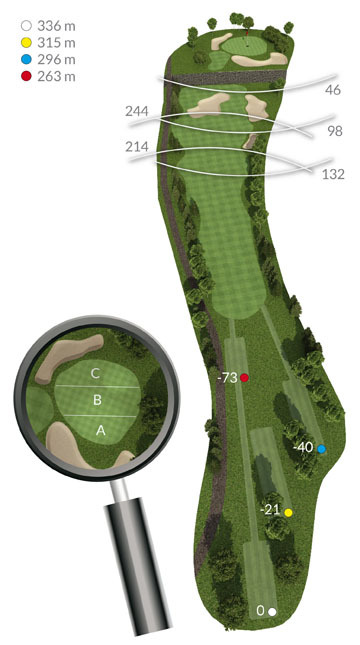 After a hole that has made us bring out the best of our golf skills, we come to this 342 meter, pair 4 from yellows, a pair 4 for recovery.I recommend that you hit the driver with a bit of draw, because the hole has a light dogleg to the left. Prepare yourself, good stroke; that ball is perfect. The second stroke is a stroke for showing off, surely you will have spectators. And so this last hole of the first round has the hotel and its balconies as background, as well as the beautiful terrace of the canteen. You know if the stroke is good when you hear the applause of the “spectating public”, it is the triumphal path towards the green. After the second great hit it is a good moment to take a leisurely walk, savoring success. Congratulations, your first round has been fantastic, ready for the other nine? Before heading to the tee at number 10, perhaps we should make a short stop at the hotel canteen “Hoyo (hole) 19” to purchase a drink, sandwich or snack to replenish our strength. The start of the second round is perfect. 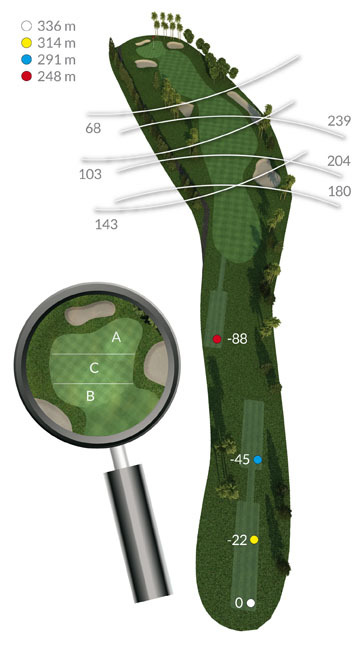 Positioned at the tee, we can observe a long 414meter pair 4 from yellows. The start of the fairway is ample, this allows us to stretch with the driver. Good drive, ball on the fairway and the green’s at 130 meters. 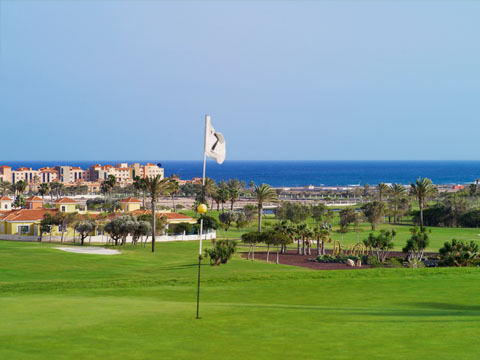 The trajectory of the tee to the fairway offers us a spectacular view with the sea in the background. This second stroke requires all of our technique and precision because the fairway narrows up and the green is protected by a large bunker. Great stroke, you’re now in the green, at least I think you’ll score a pair on the scorecard. For being the handicap 2 hole of the round, you haven’t played it bad at all. This hole is a fantastic 331 meter pair 4 from yellows with a dogleg at the left. Only the local players will try to attack the flag by crossing the trees. In this hole I think that you should follow this strategy: driver on fairway, short iron and putt for a birdie. Up for it? From the tee we can see both the great lakes of the course. These lakes serve as a zone for rest and relaxation for many birds. The evening sunlight at this point fills us with relaxing sensations. 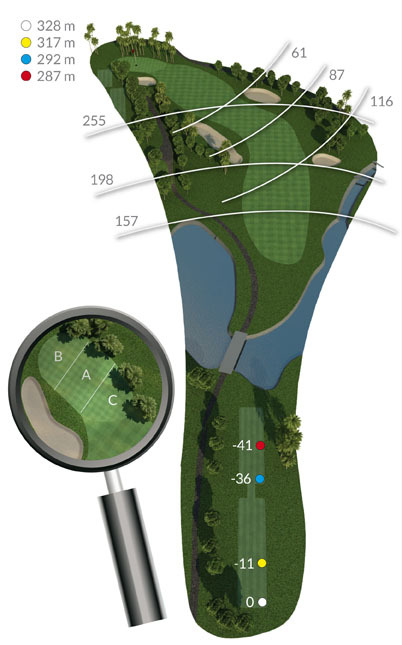 I’ll wait for you at the following hole, surely with good news. We reach the key hole of the round, 190 meter pair 3. At first it does not seem complex, the only problem may be having a stronger than usual breeze. 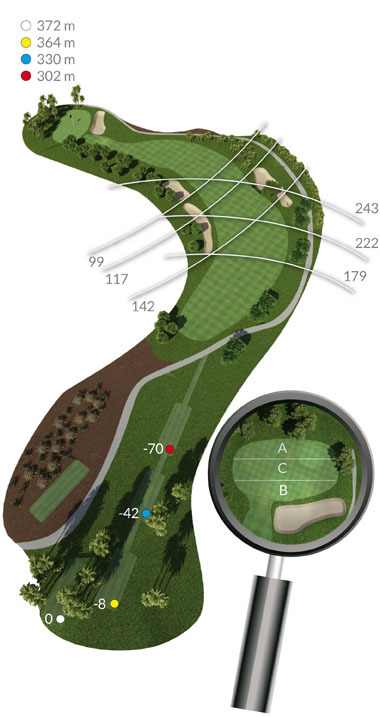 The hole is designed in such a manner that the wind, in most cases, hits you face on, slowing the ball. Fortunately today there is a soft breeze, let’s take advantage of it: On towards the green. Only one small recommendation: play long. We don’t want the ball to get stuck in the frontal creek. Good stroke, the ball closed a bit to the left. From here we have a good approach, leaving the ball ready for a pair. How’s it going? We have six holes left to play and your scorecard is quite good, this is your day. Surely you will finish a very good second round. The 13 is a pair 4, pretty long: 393 meters from yellows. It’s very difficult to see the flag from the tee due to the green being protected by trees. What we do see is an ample fairway that allows us to stretch with the driver and try to gain the maximum distance possible. Careful on the left, because though you can reduce distance to the flag, it is an area full of trees and all kinds of vegetation. A second stroke from this area would not be simple. You should aim right. Good drive, let’s go. We cross the river via the bridge and head for the second stroke. We are about six or seven meters from the 150 meter green start sign. What iron do you need? 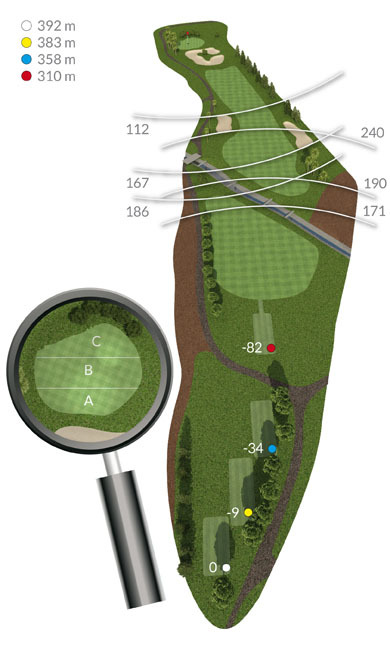 One detail you should be able to see: the front of the green is protected by a large bunker and trees. 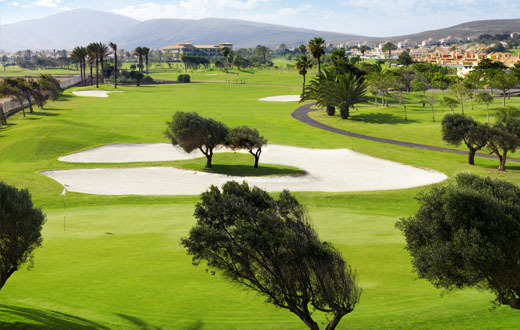 I’d play long and overshoot, behind the green there is no danger. I think that this information is enough so you can concentrate and finish the hole. See you at 14. I must confess, this pair 4 is one of my favourite holes. Standing at the tee and seeing the flag at 353 meters gives me a great senstation, don’t know about you. Definitely a hole for a strong stroke. The fairway is very wide, we only have to be careful on the left as to not land in the water, and on the right to not get off limits. 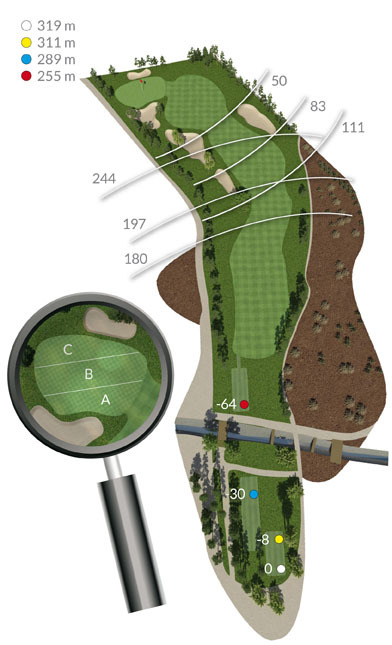 During tournaments we usually select this hole for the “Longest Drive” prize. There is a record mark – think you can reach it? Very long, let’s see where you landed the ball. This second stroke is a clean stroke to the flag, there are no frontal obstacles. 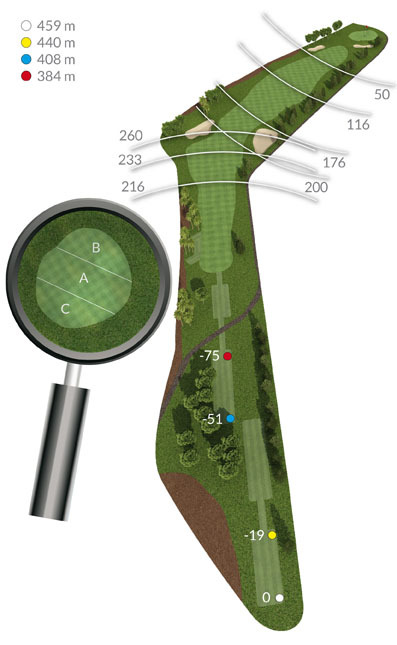 Bunkers and trees are located at the sides to penalize the bad stroke. The green is immense, impossible to miss. What was it at the end? Pair at 14? Yes, some greens are very quick and hard to read: they aren’t easy. Well, no problem. This pair 3 can help us cut back a stroke or two. 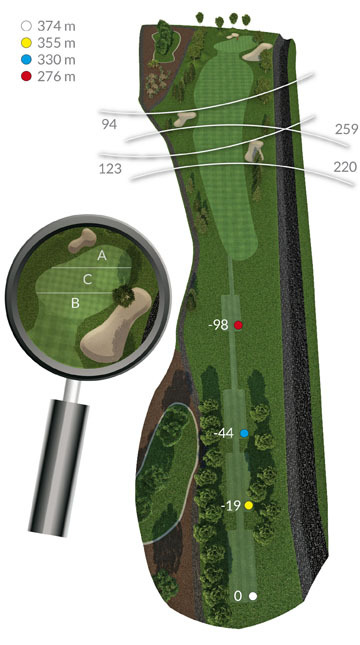 192 meters to the center of the green. 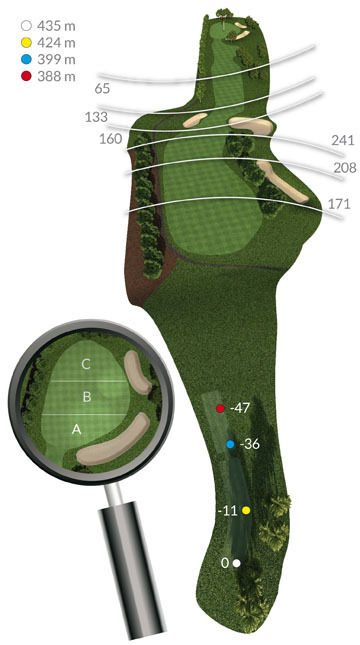 As you can see, the tee is above the fairway and we almost always get help from the breeze that comes from behind us. Let’s see: water in front at about 110 meters, bunker to the right of the green, bunker to the left, and even though you can’t see from here, the green has 2 platforms and the flag positions are easy for us. Let’s try for a birdie, though a pair isn’t a bad result because putting this green isn’t easy. Grab an iron and to the flag. Not bad at all. On the way to the green we’re “assaulted” by ducks of various colors and sizes. They’re used to players feeding them and they get close without showing any fear. What a flag position: it’s not easy today, I’ll have to be very precise with the putt. Shame we’ve missed the birdie, good putt, the pair isn’t bad at all. This hole allows us to relax a bit before facing the last two holes of the round. It is a 315 meter pair 4 with a dog leg to the left. We’ve only got to worry about not hitting the ball off limits to the left. If you don’t want to use the driver, a wooden one is enough to leave it on the fairway. After a great stroke, all we need is a good approach and then it will all depend on the putt. Today we aren’t putting bad so I think you’ll get a birdie. A brief note: try not to go too strong on the second stroke, the bunker and off limits don’t help. Pair 5, 440 meters not very long. 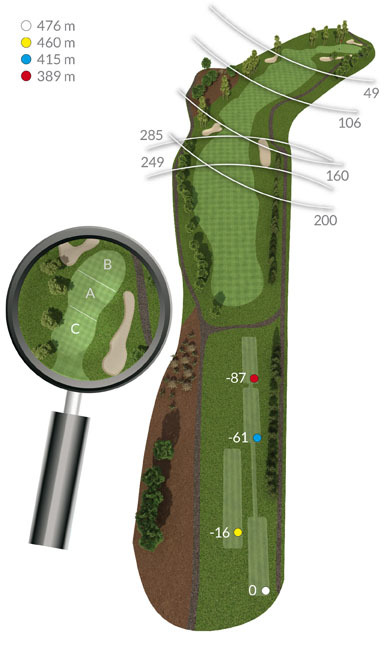 Just one detail: the green is located above the level of the fairway. 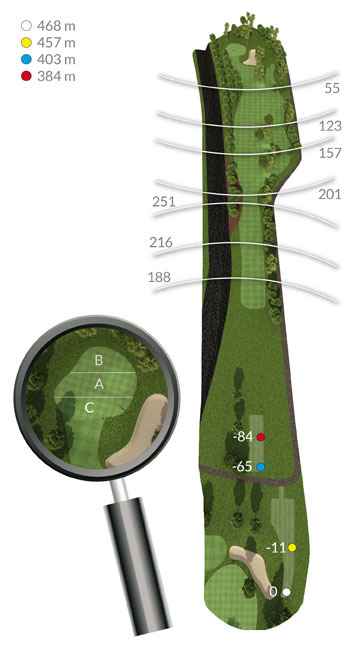 Let’s go step by step: From the tee we can’t see the flag because the hole turns towards the right. My recommendation is to select the driver or a wood and lean a bit on the left, from here we have a clean second stroke. However if you’re a fade player, this is your start. As I was saying, now we have a second stroke towards the green, here we have two choices: we can be aggressive and try a 3 wood to the green with the risk of going off limits by the sides or we can play an iron and an approach of a third stroke to the green. What strategy do you want to follow? Another detail: The flag today is on the upper platform. You have my full support. We come to the end of the round, good things never last. Isn’t the view from this tee beautiful? 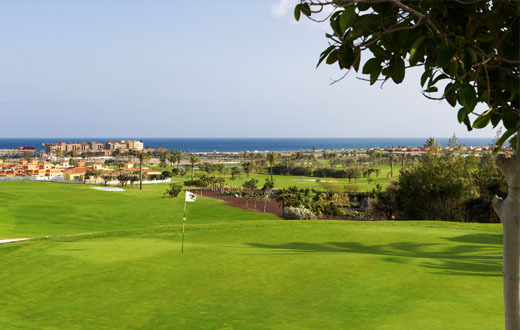 It is the best part of the course, from here we can see all the other holes, the hotel, the sea in the background: simply spectacular. 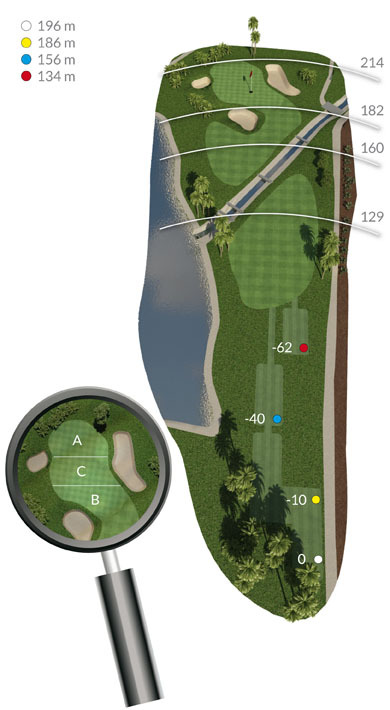 This 380 metre pair 4 is the best possible ending for the round. Dogleg to the left, off limits to the left. On the second pairt of the hole, off limits both to the left and right. My recommendation is to come out with a long wood or iron aiming towards the right, iron to the green and trust in the putt. There’s no better way to finish and take a good memory with you than with a birdie. 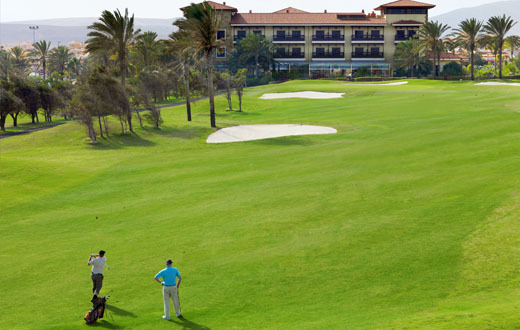 I hope you have enjoyed yourself as much as we have guiding you through our golf course.